Merrell Weiss is a founding member of the Baltimore Philharmonia Orchestra. 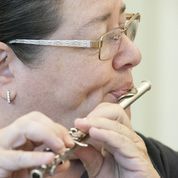 She plays flute in the BPO, but is very passionate about playing piccolo. A transplanted New Yorker, she studied piccolo with Frederick William Heim of the New York Philharmonic. She retired from the federal government after a 25 year career as a computer specialist. Merrell is very active in the local community music scene. She enjoys playing in theatre orchestras, and has performed with the St. Gabriel Miracle Players, Reisterstown Theatre Project, Liberty Showcase Theatre, Glyndon Area Players, and St. Paul’s School in Brooklandville. She also performs with the Chesapeake Concert Band and the Social Security Administration Band.